I've been in the automotive and diesel truck repair industry for about 15 years, working my way up from being a preventative maintenance tech to opening my own shop. 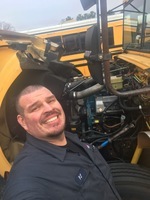 I've worked as a subcontractor roadside mechanic for a couple different companies down here in Georgia and I'm looking to expand my experience, my contacts, and my business. Philip is currently not taking new appointments. Showed up and was very nice about what was going on. Handled the appointment and didn’t give me the run around. Phillip was prompt, professional, friendly. He explained everything to me ahead of time and made solid recommendations to continue with to get my car in the best shape ever. Showed up on time. Completed the work in half the time. Phillip was great and knowledgeable. Philip was very friendly and knowledgeable about what my car needed. Had an excellent visit with Philip. He diagnosed my vehicle problem and recommended what needed to be fixed. Arrived spot on time and treated me in the driveway. Accurate repair estimate was given, now I just need to decide when I can get it repaired.